An oil spill off the coast of Newfoundland caused an estimated 250,000 litres of crude to leak into the ocean, Husky Energy said Friday. 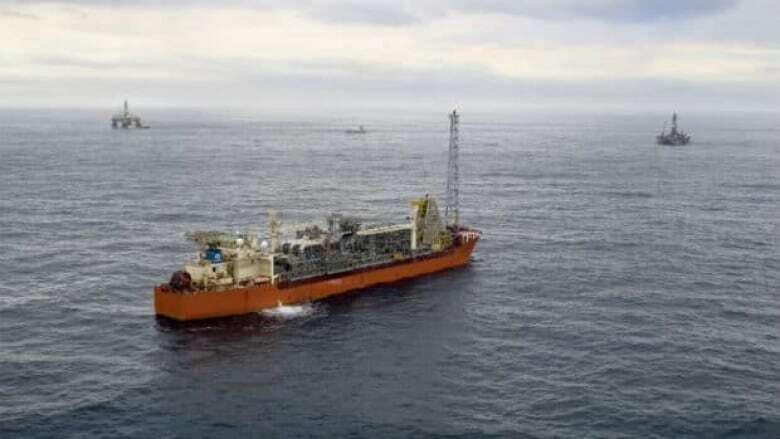 The leak, from a flowline to the SeaRose FPSO, a vessel stationed about 350 kilometres off the Newfoundland coast, happened around mid-day on Friday in the White Rose field while crews were preparing to restart production. Operations had been halted Thursday due to high winds and rough seas. Oil extraction remains suspended as the cause of the spill is investigated, but ocean swells of up to seven metres are preventing any underwater examination, Husky spokesperson Colleen McConnell said. The spill cannot be contained or cleaned up until waves subside. The provincial chapter of the Offshore Petroleum Board reported no injuries and said all wells are in a safe state. Husky said in a statement that it had deployed tracker buoys, which is specialized equipment used to track oil spills. An aircraft from Newfoundland-based PAL Airlines was also headed to the area to carry out an observation flight. Once swells shrink to four metres, remote-controlled vehicles can be sent to navigate the area around the tanker, McConnell said. Until then, responders are unable to confirm whether the flowline is still leaking, she said. The Eastern Canada Response Corporation, which deals with spills, is helping to organize inspection and clean-up, McConnell said. Husky estimated the amount of oil leaked into the ocean by how much crude had been pulled from the reservoirs as crews warmed up the flowlines. The spill is equivalent to one-tenth of an Olympic-sized swimming pool, much larger than a 2013 leak in the nearby Grand Banks field, when 6,000 litres were lost. In 2004, more than 165,000 litres of oil spilled from the Terra Nova vessel in the same vicinity. At the time, it was the province's largest spill. The SeaRose was shut down earlier this year after the petroleum board found Husky violated operations protocols during a near miss with an iceberg in 2017. In that incident, the vessel did not properly disconnect the lines which it uses to onboard oil as the iceberg approached. More than 80 crew members and 340,000 barrels of oil were on the vessel at the time, according to the board. An investigation showed the decision not to disconnect was "economically driven," according to documents obtained by CBC News at the time.